Vancouver Dyke March — August 3, 2019! 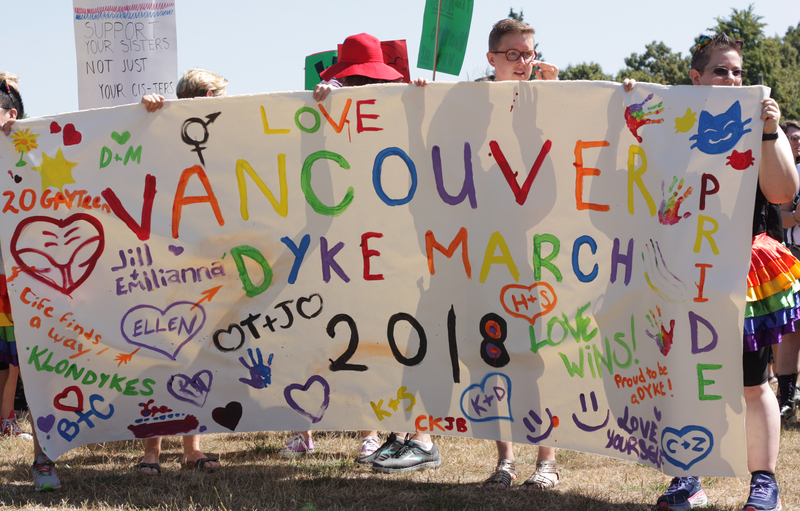 Join us for Vancouver’s 16th Dyke March and Festival! We will begin in McSpadden Park at 11 AM with some pre-March festivities and a community art project. Then, the March will leave McSpadden Park at 12 PM (noon) and we will make our way down Commercial Drive to end at Grandview Park for the Festival. The Festival will take place from 1 to 5 PM, and involve performances from various artists, feature queer-friendly vendors, and create a space to gather with friends, family, and the community. We hope to see you there! Please be aware that the March & Festival is held on one of the hottest weekends of the year. Wear your sunscreen, hats & sunglasses, and stay hydrated! Please also note that this is a non-smoking event. You may want to have cash on hand for snacks and donations! The stage performances will have ASL interpretation. We would like to acknowledge that this event is held on the unceded territory of the Coast Salish Peoples, including the xwməθkwəy̓əm (Musqueam), Skwxwú7mesh (Squamish), and Səl̓ílwətaʔ/Selilwitulh (Tsleil-Waututh) Nations.